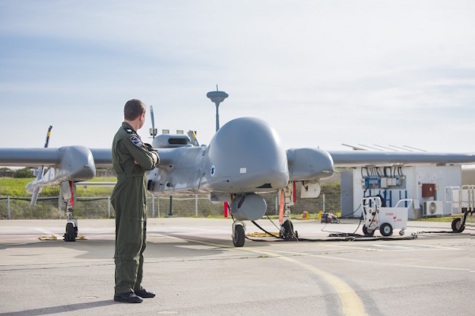 RPAV (Remotely Piloted Aerial Vehicle) operators fight in enemy territory, assist the ground forces, collect military intelligence and more, all while seated in their control stations. The discrepancy between their physical and mental states has proven to be complex and challenging, facing the operators with difficult ethical and mental dilemmas. "I think that the operators are much closer to the battlefield – they can see things that even fighter pilots can't see. We're inside the situation, from the stage of military intelligence collection and familiarization with the field to analysis of the strike's results", elaborated Lt. R', an RPAV operator at the 210th ("White Eagle") Squadron. "We may not risk our lives, but we are undoubtedly a part of the mission, from stem to stern". A poll was held, interviewing some 100 RPAV operators as part of a research managed by the IAF Psychology Branch. The operators were asked regarding their familial status and their personal relationships with their fellow squadron members. The results showed that operators in romantic relationships and single operators who are in good relations with their unit are more immune to the graphic situations they encounter. Whenever Capt. G' entered the control station to perform his mission during 2014 Operation "Protective Edge" it was clear to him that his wife was worried for him, even though his life wasn't at risk. "I saw a message from her every time I left the control station. She was always there for me", he said with a smile. "It's a difficult situation – we go to sleep together but I can't sleep because I can't tell her everything I went through. She wants to ask, but she doesn't. She knows she's going to see it in the news tomorrow and understand everything". When the research concluded, the IAF Psychology Branch released a document incorporating all of its findings and spread it across all commanders of the RPAV Division. As a result, the document became an IAF work plan regarding mental preparation in the RPAV Division. "It's interesting examining the differences between us and our American counterparts", said Capt. R', the 210th Squadron's exercise leader. "We have the feeling of protecting our homes, which gives great significance to what we do. There's a difference between sitting in your control station in Las Vegas when your aircraft is in Iraq or Afghanistan, and sitting just several miles away from the threat with the realization that you are protecting your family". Regarding the IAF's new mental preparation program, Maj. G', the plan leader from the RPAV Academy, said: "The plan was established by professionals. We provide the commanders with tools which instruct them on how to lead the service members at their command during complex missions. We hold seminars and lectures with professionals and experienced combatants who tell us about the challenges they face during combat, all in order to allow the operators to realize what they may encounter in the future". "In addition to routine lectures and seminars, the plan also includes a series of designated exercises featuring the same dilemmas, which allows the operators to experience them in real-time", concluded Maj. G'. "It's important for us to emphasize the topic of dealing with failure. Operators may encounter situations in which the mission isn't going as they expected, and they are required to keep operating at all costs".